The HTC ChaCha could be everything for the Facebook addict thanks to the handset's dedicated Facebook button and now everything has got a price tag and a release date for the UK. The portrait QWERTY Android phone will ship on June 6th with a price of $339 plus VAT if purchased off-contract, according to retailer Clove. The HTC ChaCha can already be pre-ordered on the other side of the pond and if you choose to get it with a carrier agreement of nearly $32 (£20) a month, the cost of the handset drops to zero. The handset is one of the most affordable ones made by HTC and sports a 2.6-inch screen and Android 2.3 Gingerbread, while under the hood a 600MHz processor runs coupled with 512MB of RAM. It comes with a 5-megapixel camera on the back and a basic front-facing camera. 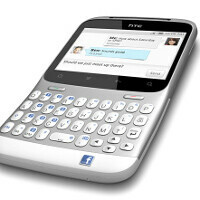 But the focus of the handset is its support for the social network, including Facebook Chat. Is that enough to lure you into buying the ChaCha?